In December 2014, at the opening of Malaysia’s largest shrimp aquaculture project located in Sabah state on the northern part of the island of Borneo, Sabah’s Chief Minister Sabah Datuk Seri Musa Aman said: "I am confident this project will help raise the living standards of the locals as it will generate more than 3,000 jobs besides the spin-over effects." Over three years later and with 2300 acres of mangroves already cleared for aquaculture, the local indigenous communities have yet to benefit from even a fraction of the promised jobs, while suffering a range of adverse impacts to their health, environment, security and culture. The Environmental Justice Atlas (EJA) reports a wide range of visible, negative environmental impacts, as well as health and socio-economic impacts, including the destruction of sacred areas and burial sites. The Pitas region is home to more than six indigenous communities who now rely on the remaining mangrove area for their livelihood. These communities have lived in the area for more than nine generations, supporting themselves in large part through foraging in the mangrove areas. The visible impacts of the large project include biodiversity loss, food insecurity (crop damage), pollution through waste overflow with visible surface water pollution and decreased water quality. EJA reports a potential risk of large-scale disturbance of hydro and geological systems resulting from the project. 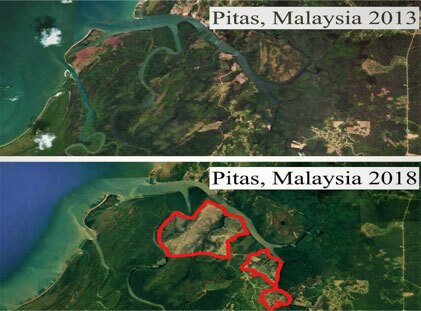 Work by MAP shows the area of high quality mangrove losses based on overhead images from 2013 and 2018, available through Satellite imagery. The Pitas development is a government initiative through state subsidiary company Inno Fisheries Sdn in collaboration with Sunlight Seafood (Sabah) Sdn Bhd, is reported to entail a RM1.23 bn (c US $320m) investment and the creation of about 1,500 shrimp ponds. Around 20% of the total funding is from state sources. Yayasan Sabah’s Inno-Fisheries is a government agency whose website states its mission as being “to uplift the quality of life of Malaysians in Sabah”. Sunlight Seafood is one of the leading processors and exporters of frozen seafood products in Malaysia. The project was initially planned to include a hatchery, a research and development laboratory and a training centre for the commercial development of the Pacific white shrimp (Penaeus vannamei). However, local people do not know where the hatchery is (or if there is one) and there is no sign of the promised training centre or processing plant. Another local farmer and fisherman, also a member of the G6 collective, says that the shrimp farm developments over 2300 acres have significantly depleted resources and affected the livelihood of subsistence farmers and fishermen in the area. Speaking at a press conference organised by Sabah Environmental Protection Association (SEPA) in 2015, he said: “We now have remaining about 1,000 acres of mangrove land which has a sensitive biosystem and hold our livelihood as well as traditional practises like traditional medicine, building materials and sacred sites. Local sources report that the clearing of mangrove areas started in April 2013, over a year before an Environmental Impact Assessment (EIA) review meeting was even held. Though Sabah’s Environmental Protection Department (EPD) issued a first stop work order in September 2013 after a ground report was submitted to the EPD by SEPA, and a second in December 2013, clearing work continued. In January 2014 EPD approved only infrastructure (water and electricity) works, but work on ponds and clearing continued, as can be clearly seen on satellite images, accessed by MAP. Media in Sabah reported that Sunlight Inno Seafood Sdn Bhd, was issued with stop-work orders and fines last year after it clear-felled the area without receiving official approvals. SEPA president Lanash Thanda commented on the abuse of process in this partly-state sponsored development: “Environmental laws have been put into place as safeguards for the benefit and protection of all our futures and the breakdown of this law and rule process should be as serious as any other crime and not as something that can be ignored”. According to her, the law is clear – there should be no development activities until the Environmental Impact Assessment (EIA) is approved. “This situation raises alarming questions with regards to other development projects. Does this mean that projects that are government linked do not have to follow the law?